-Finished Size: 8” wide and 66” long. -Yarn: Wisdom Yarns Poems Silk Solids (75% wool, 25% silk; 109 yd 100 m/13/4 oz 50 g): #702 sterling, 4 balls. -Needles Size 6 (4 mm). Adjust needle size if necessary to obtain the correct gauge. 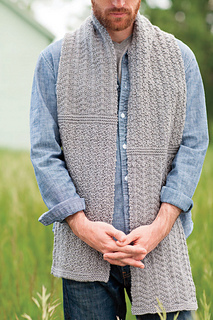 -Gauge: 18 1/2 sts and 28 rows = 4” in charted patts. 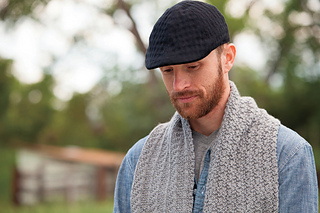 This scarf is made of knit and purl stitches combined to create dynamic patterns and textures. The final product is a scarf that is fun to knit and is sure to be worn!